This is a book that I had to read for my Apocalyptic Imagination class. For those who want a better understanding of this class, here it is: Basically we study about how the world is going to end, or discuss the world ending through biblical text, and apocalyptic/post apocalyptic text, such as stories, novels, poems, etc. 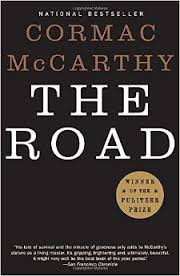 Or last book was "The Road" by Cormac McCarthy. A little Summary: The story is about a man traveling with his son to the coast in order to find better shelter from the harsh cold. During the travel they come face to face with danger, and some graphic scenes that the apocalypse had left behind. I would suggest that if you are faint of heart by even description of some gruesome scenes then I wouldn't read it and I don't want to go too much into detail because I don't want to give too much away. I like that the book puts you right in the middle of the apocalypse. There was no real reason given as to why the world was thrown into the apocalypse, which kind of annoyed me because of the descriptions given in the stories about how they found people, and stuff, but there are many theories about how the world ended in the novel and the one that I've come to agree with the most is that there was a massive volcano in Yellowstone that had erupted. The book leaves it open ended for the reader to use their imagination on what exactly happened. Another unique point of the book is that they refer to the two protagonist as "the man" and "The boy" but the boy often refers to the man as Papa which signifies that they are father and son. As I stated before, the story does not sugar coat anything. I had no issue with it, but there were times when the story just made me sad because it was just this child that was born into this dismal world. The story actually made me feel the pain for the Father because I know that he hated the ideal that his son was being raised in this world, and there was nothing he could do about it. He attempts to strip the son of the one thing any child will still cling to, and that is pure innocence. I felt how the son felt, and I felt how the father felt, and it takes a lot to make me feel as if I'm in the book with the main characters. Overall, I highly suggest this book. I ended up reading this whole book in 4 days flat because I couldn't put it down. I found some interesting interviews where he mentions that The Road was inspired by his son, whom I'm assuming was born in 97', which makes the story more compelling. If you love Post-Apocalyptic reads, and want to go on a journey, below is a link to Cormac McCarthy's book, The Road.